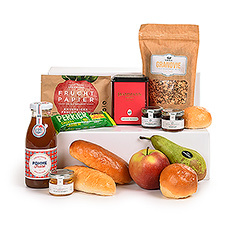 Next day delivery of breakfast gift baskets in the Netherlands. Our breakfasts to the Netherlands contain fine breakfast treats for many mornings to come. 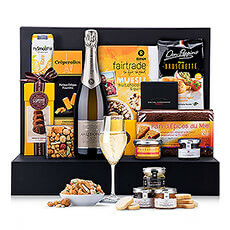 Surprise a loved one in the Netherlands with a breakfast gift basket featuring fine gourmet delicacies by Godiva, Jules Destrooper and other favourites. 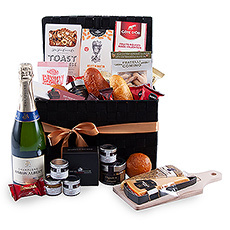 Greet the day with a gourmet breakfast basket packed with morning treats. 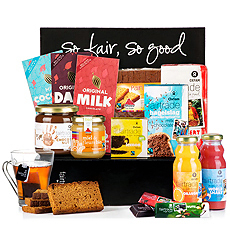 GiftsforEurope creates a tempting collection of breakfast gift baskets for delivery to the Netherlands. 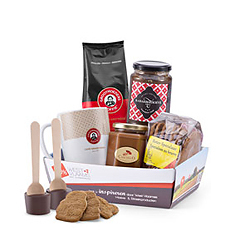 These beautiful brunch hampers contain everything you need for a traditional breakfast. 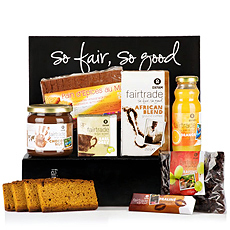 Gather the family around the breakfast table to share Oxfam Fair Trade coffee and tea, Cava Spanish sparkling wine, juicy fresh fruit, Royal Belberry jams, Barú hot chocolate, fruit smoothies, cakes, chocolate spreads, and more. 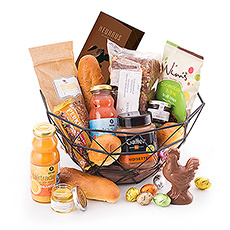 And since no Belgian gift basket would be complete without heavenly Belgian chocolate, every breakfast gift basket also includes chocolate by Godiva, Corné Port-Royal, or Oxfam. It is the sweetest way to start the day. 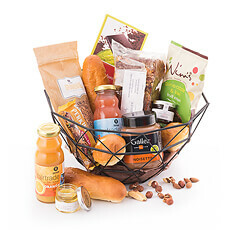 Our breakfast gift basket collection is a popular gift for all family occasions in Holland. 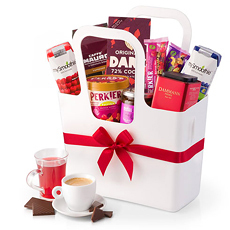 With plenty to share, they are perfect presents for housewarming gifts, hostess presents, birthdays, weddings, thank you gifts, anniversaries, and Christmas. 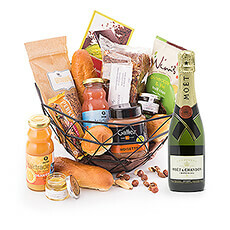 For romantic moments, our Romantic Gift Basket is a perfect gift for two. Every brunch hamper is hand-packed with care in our local warehouse. We offer express next day and Saturday international delivery for the Netherlands, including to Amsterdam, Rotterdam, the Hague, and Utrecht. 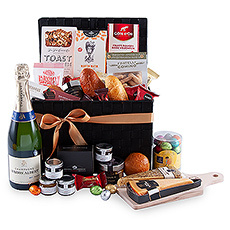 No matter what the occasion, a gourmet breakfast gift basket is sure to turn anyone into a morning person!